Birds at the beach never cease to amaze. they capable of migrating extremely long distances non-stop (some manage several days at a time and thousands of miles over open water), there are different species on the move year round. 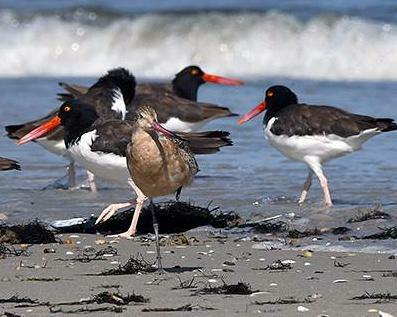 Fall is a great time of year to go to less trafficked beach areas and check out the shorebirds there. Oystercatchers, terns, skimmers, all kinds of sandpipers and plovers are either massing up to take off for the trip south, or have already found their overwintering grounds. It’s the right time to see lots of different species in large numbers. At a relatively quiet nearby beach in NJ, oystercatcher numbers have increased from maybe a dozen in August to about 80 in September. There will be over 100 of them before they take off in October or November. Sanderlings are up to around 500 now, but will number in the thousands in a few weeks. Caspian Terns are in a flock of nearly 60 now. There are hangers-on like the first-year Piping Plover who is spending time with the Sanderlings and the Marbled Godwit who is hanging out with the flock of Oystercatchers. There is safety in numbers, and lone birds take advantage of larger flocks which will tolerate them. The Godwit was so exhausted on his first day after landing he seemed to use the oystercatchers as sentinels to let him know when there was danger while he was sleeping. Every time he was awakened by their calls or movements, first he looked straight up for raptors. Then a quick look around and then, if it was just a false alarm, immediately back to sleep. But when the flock flew off, he went with them, having to restrain his clearly much stronger, more precise and faster flight so as not to outfly the beautiful but clumsy oystercatchers. Although some shorebirds will tough it out over the winter in the northeast or even New England, most will opt to go to South America when it gets cold. But before they leave, some species will gather in large flocks. If you want to get great views of masses of shorebirds, now is a good time to do it. They won’t be in breeding plumage, but they are easily seen foraging to build up their stamina for migration and are joined by a number of juveniles not yet strong enough to make the long flight. Consider taking an off-season trip to a less-traveled beach and see what large flocks and unusual shorebirds you can find.